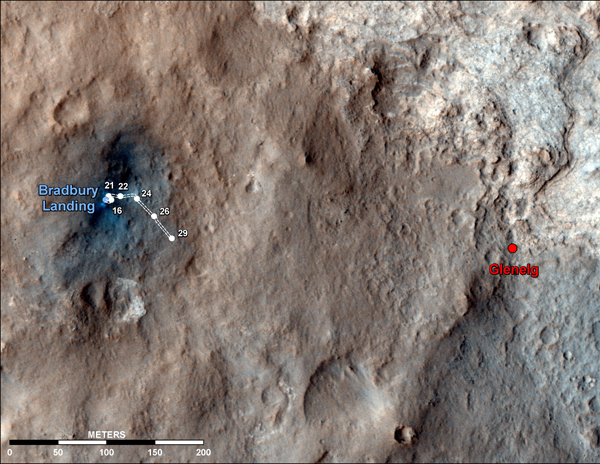 NASA's Curiosity Mars rover has driven some 357 feet from its landing site on the floor of Gale Crater -- 269 feet as a martian crow might fly -- on its way to an intriguing area five times farther away where three different types of rock come together. Project officials said Thursday the rover continues to chalk up near perfect scores during extended checkout operations, with detailed robot arm tests on tap over the next week or so. "We've been on the surface of Mars for about a month and Curiosity continues very healthy and continues to surprise us with how well she's doing everything we ask of her," said Mission Manager Mike Watkins. "We've continued to drive a little bit. We are about a football field or so away from the touchdown point." Curiosity is slowly making its way toward an area known as Glenelg, where orbital photographs show three different rock types come together. 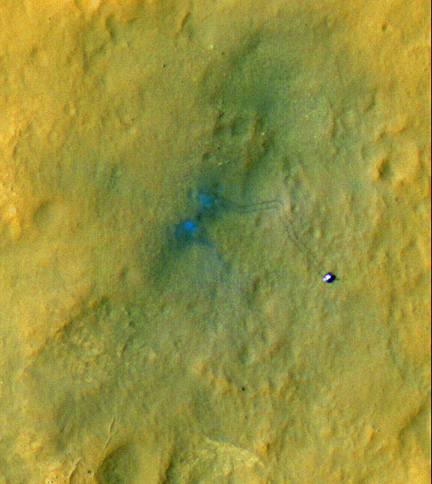 A new photograph from NASA's Mars Reconnaissance Orbiter shows the rover with its tire tracks stretching behind it, a clearly visible sign of the vehicle's slow-but-steady progress across the floor of Gale Crater. But flight controllers are pausing the trip for about a week to thoroughly test the rover's robot arm and its turret of instruments and sample collection tools. 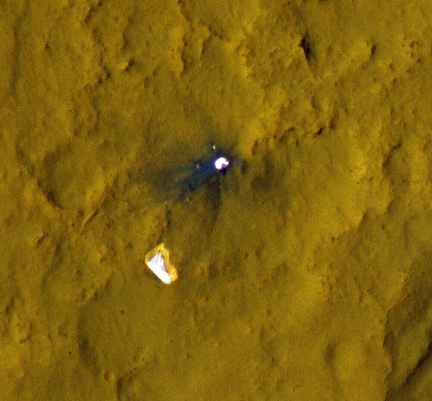 During its first few weeks on Mars, Curiosity has collected spectacular pictures of the area around the landing site along with valuable scientific data from a laser-firing spectrometer known as ChemCam, a radiation monitor, a compact weather station and a Russian instrument that remotely probes the ground below the rover. At the same time, engineers have put the rover's electrical and mechanical systems through their paces in what they call characterization phase 1. 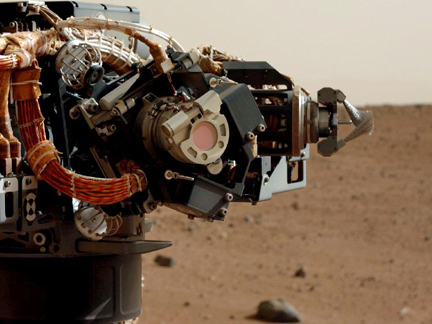 CAP-2 is primarily devoted to testing and calibrating the robot arm and a turret of tools and instruments on its end, including a rock drill, a sample scoop, a dust removal tool, an X-ray spectrometer known as APXS and a high-power camera known as the Mars Hand Lens Imager, or MAHLI. Engineers will spend the next week or so testing the robot arm systems before Curiosity resumes its trek toward Glenelg. Along the way, the science team will be looking for suitable rocks to serve as targets for the X-ray spectrometer and ChemCam instruments, as well as fine-grained soil that can be scooped up by the arm and into two analytical instruments for detailed examination. "Everything but the arm and sampling systems is already operational," Watkins said. "In that sense, a lot of the vehicle is checked out -- the cameras, ChemCam, the environmental instruments, all of that stuff is now checked out. They've all been in use ... and we're getting a lot of science out of that. "At the end of CAP-2, we believe all the contact science (will be) cleared, meaning APXS and MAHLI. That will take us about a week to complete. And then we'll start driving again and look for the right science targets to use those capabilities on." He said the team wants to get a bit of practice with the arm before attempting to scoop up any soil samples. "That's kind of the last thing we have to do to fully certify all the capabilities of the rover, and I think that that first sampling is probably a month away, or something like that." 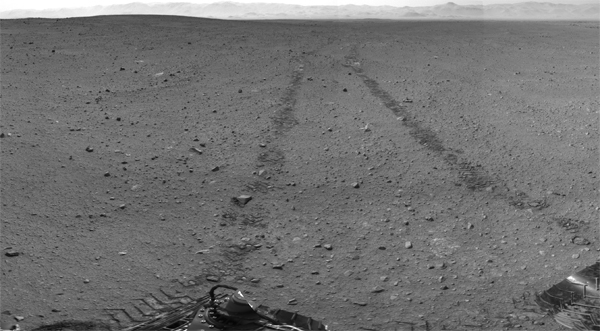 As with everything, the rover will walk before it runs, testing soils before attempting to drill into rocks. "Probably sometime maybe a month from now, maybe little bit before that, we're going to try to scoop first because scooping is a little easier than drilling," Watkins said. "And so the first soil sample will be scooping some soil from Mars and putting tat through our instruments. I think drilling will probably be weeks after that, more than one month from now and maybe a little longer than that." Curiosity's long-range goal is Mount Sharp, a 3-mile-high mound of layered terrain in the center of Gale Crater about five miles south of Glenelg that represents a time capsule of sorts capturing hundreds of thousands to tens of millions of years of martian history. The rover will attempt to climb up into the foothills of Mount Sharp to study the transition between clays and soils that likely formed in the presence of water and overlying, more recent layers that represent drier environments. But Curiosity won't get there anytime soon. "When we start actually going to Mount Sharp from Glenelg, we'll use our full driving mode and might be able to drive up around a hundred meters a day or so, assuming the terrain is safe terrain," Watkins said. "Driving a hundred meters a day ... that would say it would only take three months to drive to Mount Sharp. "Of course, we expect to have some terrain there where we don't make that kind of progress. But more importantly, I think we'll stop and do some sampling and do some other science along the way. So we might actually be driving one third to one half the time. It really depends on how interesting the science is along the way." Joy Crisp, the Mars Science Laboratory deputy project scientist, said there's little doubt it will be interesting, raising the prospect of frequent stops and starts. "There are two main things that have intrigued me (so far) and, I think, most of the team," she said. "One would be the imaging of Mount Sharp and seeing the structures and layers. We're not sure what it all means, but it's pretty spectacular and not something we've ever seen before on Mars. "The other would be the rocks nearby. Some of them are showing quite amazing textures that we've not seen before on Mars, some that look like they might have big mineral grains in them that are light in tone in a dark matrix. Just eye popping, but we don't know what it means. We need to examine rocks like that more thoroughly, close up, to get at how those rocks formed."